Following yesterday's international trailer for the Toronto Film Festival selected Third Person, the first poster for the film's release in the United States has arrived, but the film doesn't yet have a date to hit theaters. If you look hard enough, you can see Liam Neeson in the background, and we're not sure why he's being given top billing since the film follows him along with Adrien Brody and James Franco, with all of their stories in Paris Rome and New York (respectively) intersecting somehow. The dress blowing away like paper is a nice touch, but after yesterday's trailer, we're not all that excited to see the film itself. 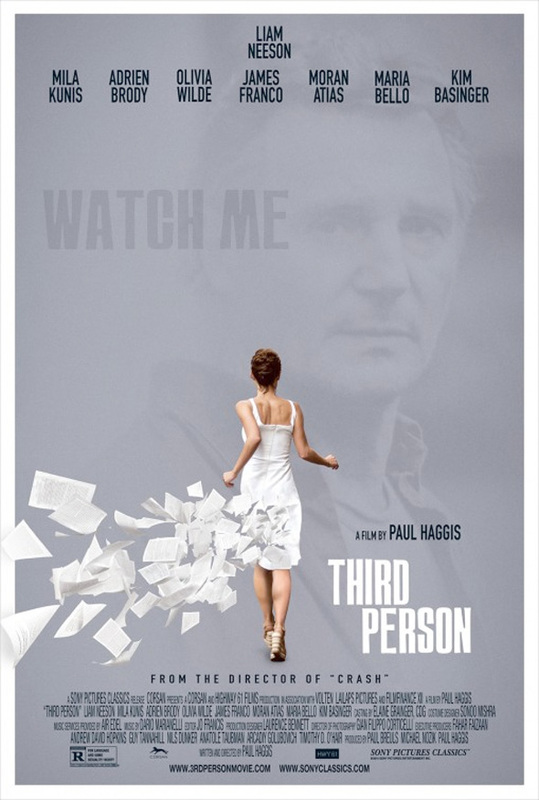 Third Person is written and directed by Paul Haggis (Crash, The Next Three Days) and follows three stories in Paris, Rome and New York, each with hidden connections between Michael (Liam Neeson), a writer whose latest manuscript has been refused, so he flies off to Paris to rethink his life, leaving his wife (Kim Basinger) behind in the States; Sean (Adrien Brody), who finds himself wandering Rome and befriending a Romanian woman in a bar; and Rick (James Franco), living in a tiny New York apartment with his son from a previous marriage and new girlfriend. Gradually, each one of these stories unveils its secrets, testifying to the whims and complexities of life. The film premiered at TIFF 2013, but does not have a US release date.